4-pin RGB led strip connectors kit,which is designed for LED Strip 5050/3528 RGB strip light.It is easy to cut, and can be jointed with connectors by yourself. Durable design for DIY LED Strip Project. 【Application】--RGB LED Strip connectors kit fits 5050/3528 RGB LED chips with 10mm 4pin wide strips. 【Easy Installation】--Can be jointed with connectors by yourself.No soldering, no screw terminals. Just slide in and clamp down. 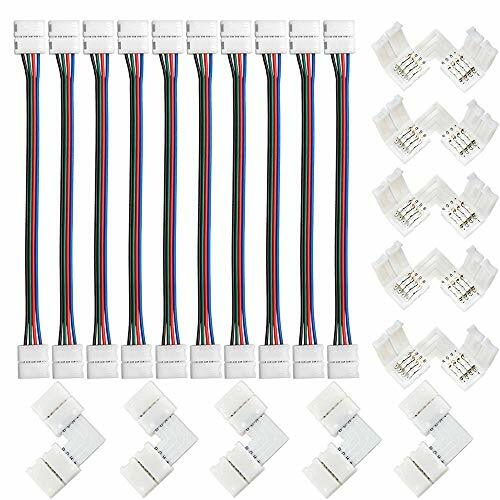 【DIY Design】 This led strip light connectors kits including most commomly use connectors,10 PCS Strip to Strip Jumpers,10PCS L-shape corner connectors. Purchasing this connectors kits,perfect corner, showing the best effects. 【Material】--This led strip connector material is Copper wire + Insulating plastic.PBT FIREPROOF MATERIAL: Made from fireproof material, high temperature resistance. They can not be ignited easily. 【Quality Warranty】FSJEE Led Strip Corner Connector with 1 Year Warranty,30 Day money back. If you have any questions about this product by FSJEE, contact us by completing and submitting the form below. If you are looking for a specif part number, please include it with your message.